Hey everyone! Today, I share the mic with Garrett Moon, one of the Co-founders of CoSchedule, a marketing management platform. 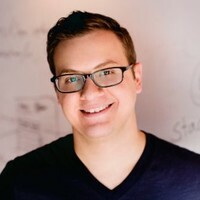 Tune in to hear about Garrett’s 10 years’ experience in the advertising/marketing industry, how he believes he’s solved the makeshift marketing problem and why it’s important to have a separate growth marketing team from the content marketing team. [00:50] Before we jump into today’s interview, please rate, review, and subscribe to the Growth Everywhere Podcast! [01:35] Garrett has been in marketing and advertising for over a decade. He got his start at an ad agency as a Creative Director. [01:50] He met his Co-Founder for CoSchedule at the ad agency. [02:20] They made the switch from a service-based company to a product-based company, which is how they ended up creating CoSchedule. [04:22] The first iteration of CoSchedule was intended to connect WordPress and social media accounts. It was a plug-in that only worked with WordPress. [05:00] The goal of CoSchedule was to automate the promotion process as much as possible. [05:30] As they moved up-market, the product continued to develop. [06:25] They wanted to create a product that could combine all the information into one marketing calendar, so you could easily manage marketing teams. [06:58] It gives a great bird’s-eye view. [07:52] Garrett believes there is a makeshift marketing problem. [07:58] Makeshift marketing is using a ton of different tools to get one job done. [08:35] CoSchedule sought to create a way to erase the need for tons of tools and bring all the information together in one place. [09:55] The least expensive plan is $50/month and gives you everything you need to integrate blog posts, manage email marketing, and social promotion. [10:47] Plans go up to six digits per year for larger, enterprise companies. [11:42] Garrett started his agency in Bismarck, ND. [12:15] When they launched in 2013, they had four angel investors. [12:30] The company consisted of two engineers and the co-founders. [15:45] CoSchedule provides 60 tech jobs that wouldn’t otherwise exist in North Dakota. [17:40] Garrett likes to ask what the one thing that a given company is focused on and will they get the right results using metrics? [18:15] Even though people say not to take stock in page views, Garrett still thought it was important to track. [20:50] CoSchedule focused on getting traffic more so than conversions, because they knew they could make conversions happen once they had a solid amount of traffic. [22:10] The metric they focused on was how to get more traffic. [22:33] By focusing on page views, they were able to generate results rather quickly. [25:00] Garrett and his team looking into what their competitors were doing to see what they could do better. [27:30] It’s important to check comments on your marketing content to see how people are reacting. [28:10] High-performing content has up to a 20% conversion rate for CoSchedule. [29:10] Garrett’s team is working on improving calls-to-action to increase conversions. [30:10] Whenever they launched a new feature, they would create content about it. [30:35] They are not shy about using their email list and social accounts. [31:28] They have both a growth marketing team and a content marketing team. [33:00] Garrett has written a book called The 10X Marketing Formula.